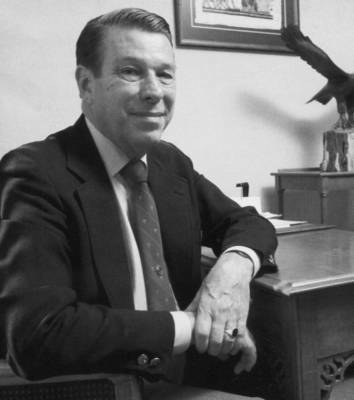 Much credit for the pioneering efforts in ultrasound at the Bowman Gray School of Medicine must go to Dr. James Toole, Chairman of the Department of Neurology and a worldwide leader in stroke research. 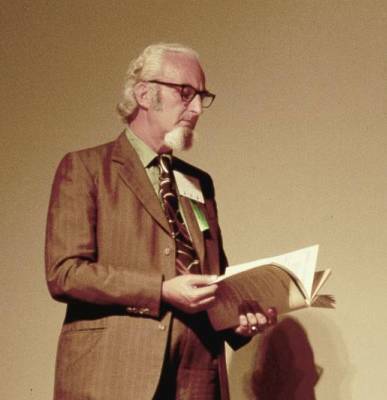 William M. McKinney, one of the true "pioneers" in ultrasound was a faculty member in the neurology department and was given a lot of support in his early ultrasound ventures by Dr. Toole. 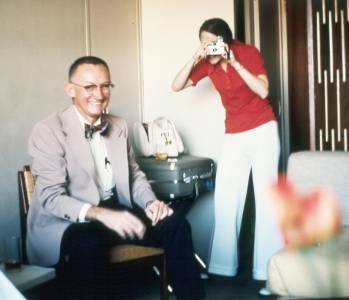 Dr. McKinney went on to become a president of the American Institute of Ultrasound in Medicine (AIUM) and served as "host" for the annual AIUM convention in 1975 in Winston-Salem, N.C. Dr. Toole is seen in the pictures below in both formal and informal modes. 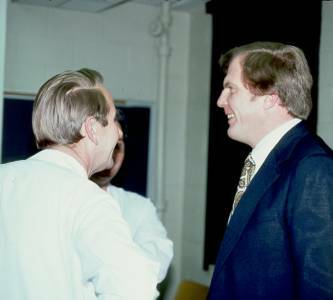 Dr. McKinney had a knack for getting all sorts of people from the medical center involved in ultrasound in the early days. 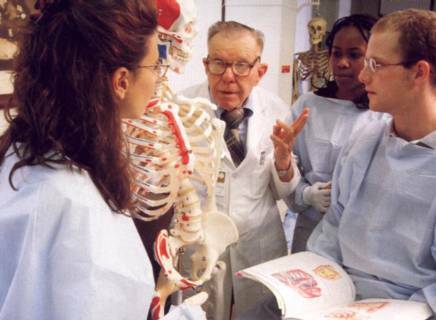 In addition to physicians from cardiology, obstetrics and gynecology, nephrology, neurology and radiology he also involved teachers from the basic medical sciences, particularly from the anatomy department. 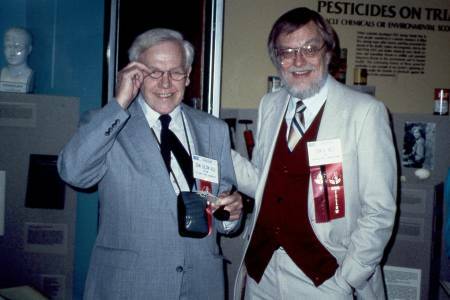 Shown below are Dr. Walter Bo (left image) and his right-hand-man Dr. Charles E. McCreight (right image). 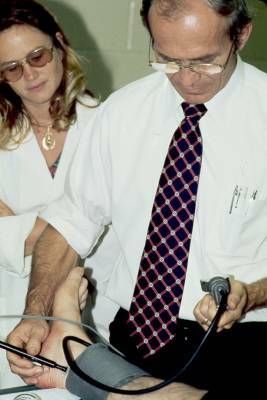 Dr. Bo put together some of the earliest anatomic teaching material oriented toward ultrasound imaging and provided cross-sectional anatomic specimens for use in both live and audio-visual based teaching sessions. 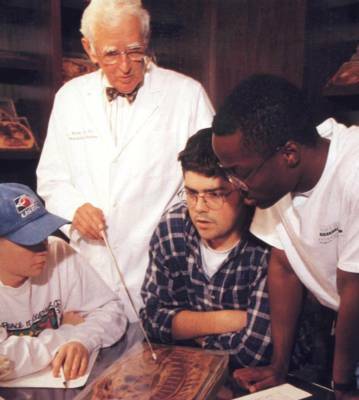 Along with Dr. McKinney he published articles on the role of the vasa vasorum in carotid atherogenesis. 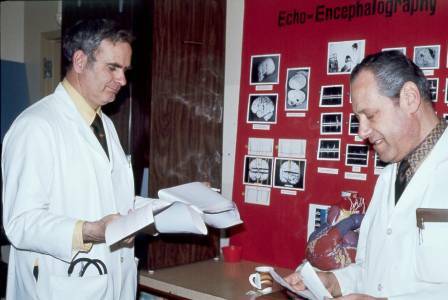 · Bo WJ, WM McKinney and RL Bowden (1989) The origin and distribution of vasa vasorum at the bifurcation of the common carotid artery with atherosclerosis. Stroke, 20 1484- 1487. 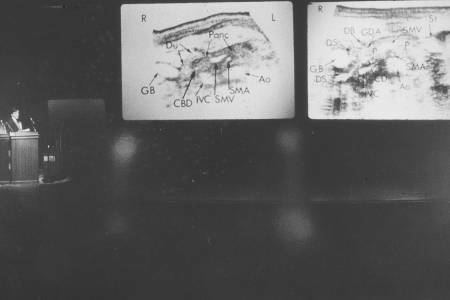 · Bo WJ, M Mercuri, R Tucker and MG Bond (1992) The human carotid atherosclerotic plaque stimulates angiogenesis on the chick chorioallantoic membrane. Atherosclerosis, 94:71- 78. Patricia Bealefield (San Diego AIUM meeting, c. 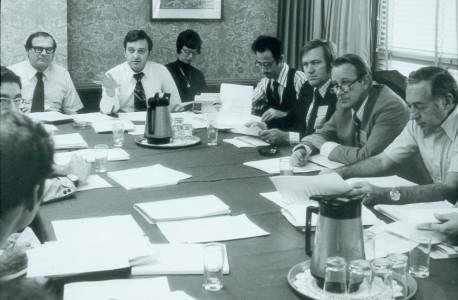 1978?). 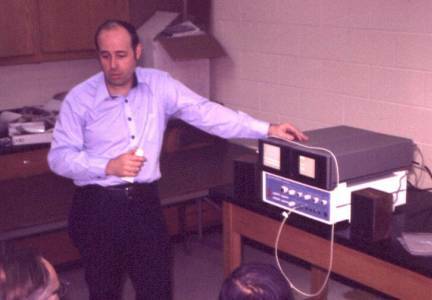 first sonographers was Jim Rhea, now (2000) with GE Ultrasound. (possibly with the first name Linda)? 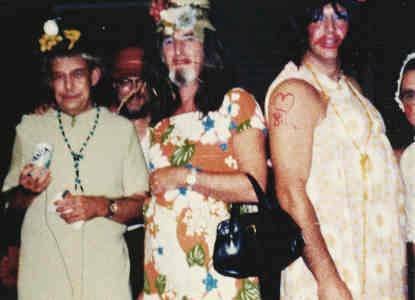 These pictures, possibly from the Seattle AIUM meeting in the early 1970's show Joe Holmes (green dress with beads), Dennis White (orange dress and handbag), Ross Brown (yellow beads and arm tattoo) and Ralph Barnes (baby bonnet, red cheeks). Exactly what was going on here one can only imagine*. 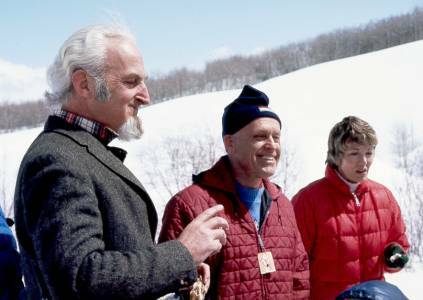 Can anyone identify the man in the red hat? 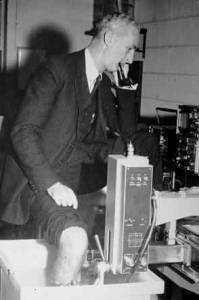 also the co-operation of his lab who were the southern accents that told the story over loud speakers. 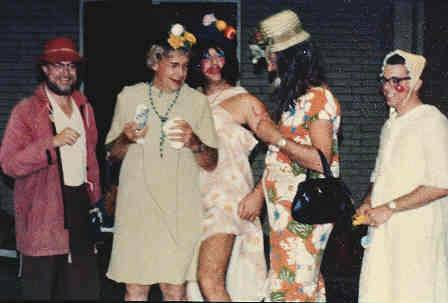 Ralph Barnes was "Bill McKinney when he was a baby, hence the get up, Dennis White Bill's mother etc. There is much more to this story that is too long to tell and I do not want to go into over the email.....!! Bill survived although he was very concerned about what might have been drug up from his past." Its been a long time since we last saw each other. Joan showed me your history page recently and then your e-mail arrived on the 24th inquiring if I could identify the ATL unit that I was showing. I think the presentation may have been my first visit to Bowman Gray which my guess would put about 1975-76. 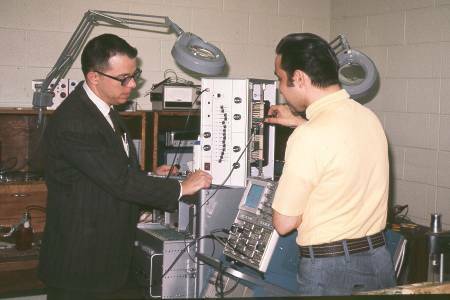 The unit is the Doppler part of the first ATL duplex scanner. 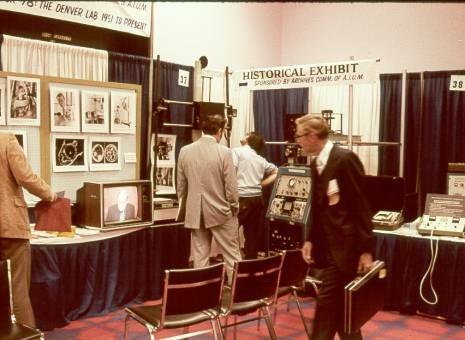 The Doppler was a model 400B. I happened to find in my papers a brochure for that first Duplex which I will scan and send you a photo of the unit. 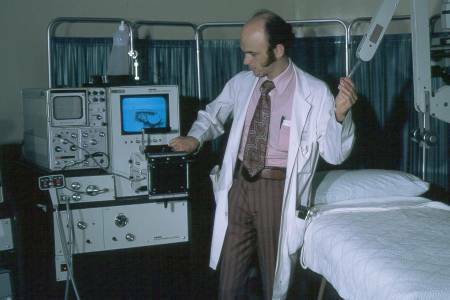 We started the technology transfer to form ATL in 1974 and that led to the Model 400 Pulse Doppler which was shown at the AIUM meeting in the fall of 1974. 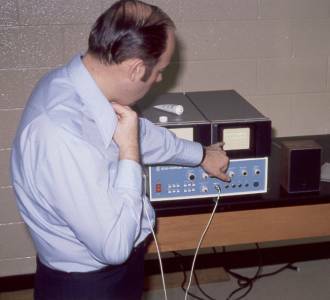 The Duplex Scanner transfer began in 1975-76. 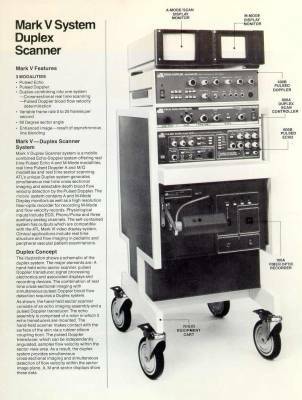 The 400B Doppler unit development preceded what later became the ATL Mark V Duplex Scanner. I recall meeting you at Bowman Gray on that trip. I have a pretty clear recollection of the whole Doppler History from the U of W program starting on 1958-9 if you wish more information. 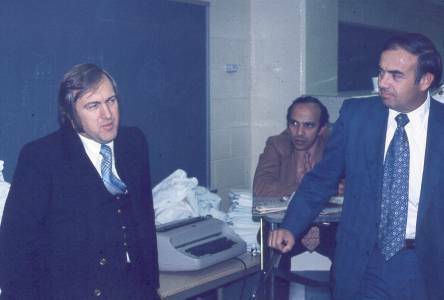 I was also involved in the recruitment of Jack Reid to Seattle after he graduated from Herman Swans program at Penn, and he then joined our program in about 1974-75. 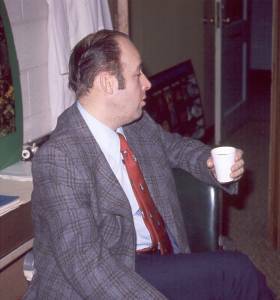 Dr. Denis N. White - the second and third pictures were probably made at the AIUM Spring Meeting at Snowmass, Colorado about 1974 or 1975. Can anyone identify the two people with Dr. White in the third picture? 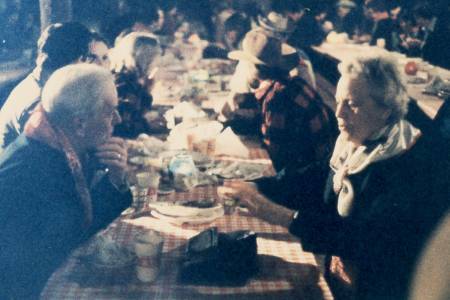 (Possibly Dr. Wes Nyborg in the hat and a Mrs. Metzler in the red down jacket). 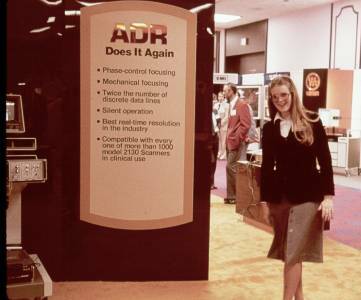 Dr. Inge Edler and his wife at the AIUM meeting in Dallas, TX c. 1977. Drs. 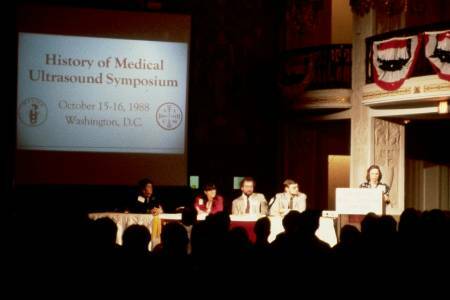 Edler and Hertz at the History of Ultrasound Symposium in D.C., October 1988. Can anyone help with the people indicated by question marks? 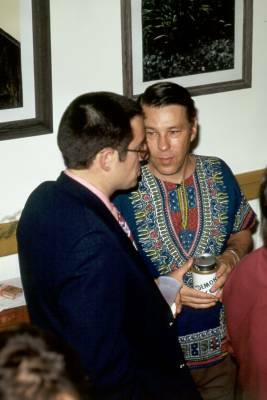 **Thanks to Joan Baker who identified Dr. Mark Lapayowker of Temple University. important advances in ultrasound transducer design and signal processing. 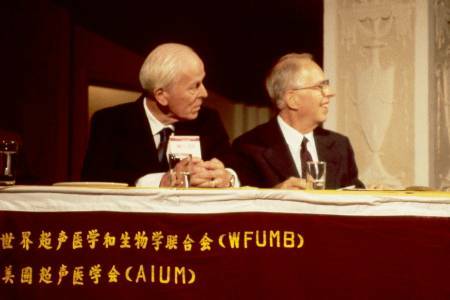 Among his graduate students were Olaf von Ramm and Stephen W. Smith. 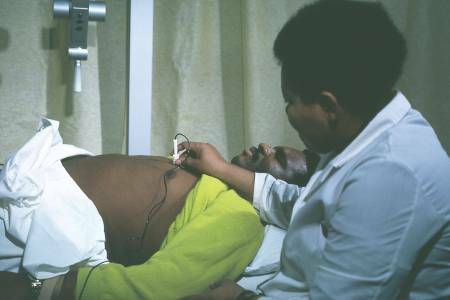 Henrietta Givens scanning Ben Singletary at Bowman Gray, c. 1975.
at the Wake Forest University Baptist Medical Center in Winston-Salem, N.C.
Henrietta's friends were saddened by her death on June 7, 2000. "pencil probe" for blood flow detection for ankle blood pressure measurement. Observing Dr. Strandness's technique is Harriett Nichols. 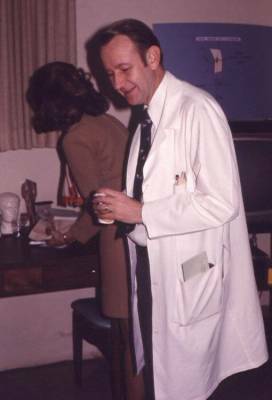 in San Diego, about 1978.
first of the three photos of Dr. Denis N. White.